Samsung Music Hub is powered by 7Digital and it is a very good way to have an intuitive playback system while you are searching or downloading tracks. The applications will also help you to discover new things about artists, their albums or any other information that you seek. Search into your Samsung Galaxy Note II for this application and download it from Google Play Store if isn’t preloaded. 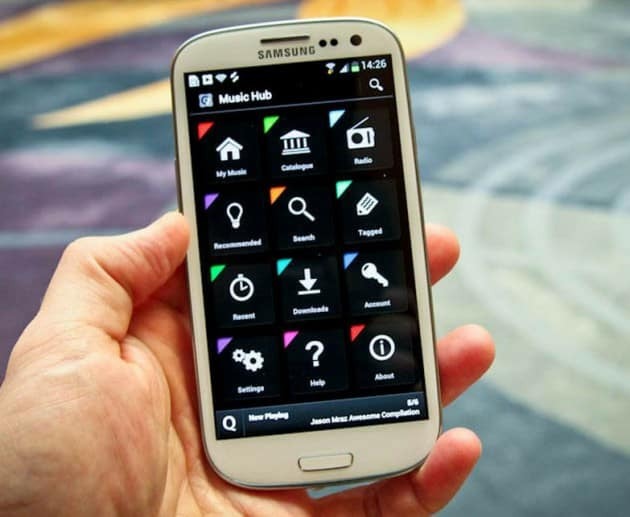 You will need a Samsung Account to use it and you will easily create one when you will open the Music hub on your Galaxy Note II. Remember that you will be logged into your Samsung Account, every time you open the Music Hub. You will notice a message on your screen that is asking permission for using the application on your carrier’s data network. Tap Ok. The main page of the Music Hub will provide access to 12 different views and features. My music: lets you see your playlists and tracks. Store: is allowing you to search and purchase new songs. Radio: you can stream songs from the internet to your Samsung Galaxy Note II if signed up for Music Hub Premium. Recommended: the application creates recommendations based on the songs listen the most. Search: into this section, you can search for albums, artists and songs. Tagged: you will find the tracks tagged for easy access. Recent: shows tracks played recently. Purchases: this feature shows all your purchases. Account: allows you to see your Samsung Account information. Account: it is showing the Samsung Account used. Sign up for Music Hub Premium: this feature allows you to sign up for a Music Hub Premium subscription. Forgot Password: allows you to change your Samsung Account password. Change Account Information: view and change your account information. Statistics: view Music Hub usage statistics. Deauthorize Device: allows you to disconnect the device from your Samsung Account. Reset application: allows you to reset all Music Hub settings. Settings: create your own Music Hub application settings. Show Device Memory Songs: shows all tracks on your memory card and device. Portrait Only: allows you to disable screen rotation and show the application in portrait mode only. Only When Plugged In: allows you to enable content download when the device is connected to charger. Wi-Fi/Cellular: allows you to decide when you want to download your purchases. You can choose between Wi-Fi Only and Wi-Fi or Cellular. Equalizer: allows you to enable the equalizer. Help: access Music Hub help files. About: view information about the Music Hub application. Shuffle: shuffles all tracks from Now Playing queue. Repeat: it will repeat all songs if you tap it once. It will repeat current song if you tap it twice. Find similar: tap it to have similar tracks into your library. Share: allows you to share your tracks on social networks or email. Add to: add the currently playing track to Tagged Songs. Track Position: shows the time left on the current track and the time already played. You can touch and drag the indicator to any position to advance or rewind the currently playing track. Skip forward: tap it to skip to the next song. Hide player: tap it to return to the previous view. Pause: tap to pause the current song. Tap it again to resume playing. Queue: touch to view the current now playing queue. Skip Backwards: touch once to start the currently playing track over. Touch again to skip back to the previous track. Now Playing Album Art Carousel: tap once to hide the music player icons. Tap again to show a larger version of the album art. Tap and swipe the album art left or right to scroll through and select any track in the queue to immediately begin playing. You can press the Menu key anywhere into the application and you can access the Equalizer, Settings or exit the application.